The latest Ford F-250 Duper Duty generation debuted in 2008. Compared to the previous generation which ran from 1999 to 2007, the latest F-250 has better handling, stronger frame, revised styling, improved turbo diesel engine and a nicer interior. 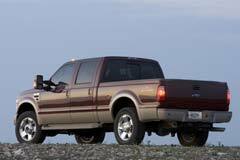 There are three body styles available when buying a used Ford F-250; extended cab, regular cab and crew cab. It has five trim levels; XL, XLT, King Ranch, Lariat and the ultra-push Platinum. There is also a choice of two engines; a 6.7L turbo diesel V8 which produces 400 horsepower and 800 pound-feet torque and a 6.2L gasoline mill that cranks out 385hp and 405 lb ft torque. However, both engines have a 6-speed automatic transmission, optional four-wheel drive and standard rear wheel drive. The interior of the F-250 cabin is dominated by hard plastics. The Lariat has rich leather and other added amenities while those who opt for the Platinum and King Ranch models get to enjoy features such as the My-Ford Touch Electronics Interface and a heated steering wheel.